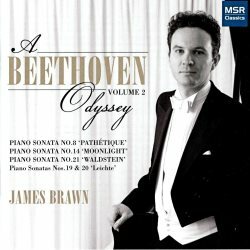 The English pianist James Brawn here presents three of Beethoven’s most well known and loved piano sonatas. These are accompanied by two early works; early despite their opus numbers. The Pathétique receives a splendid performance, which bodes well for the rest. Clear, thoughtful playing throughout and avoiding sentimentality in the famous slow movement. I like the delicacy in the Rondo avoiding the heavy-handedness found in certain pianists. The recording captures the piano splendidly. Recordings of the Moonlight must be in the thousands but one never tires of this supreme masterpiece, especially with such insightful playing. The highest complement to be paid is that when listening to Brawn, other performances do not come into the equation. His tempo seems entirely appropriate and the listener can enjoy the music without concerns about the mechanics of the performance. The stormy Presto agitato is a veritable tour de force showing great mastery and conveying the stormy personality of the composer. The Op. 49 pair date from the mid-1790s when Beethoven was 25. I love them both, particularly the Rondo of the second which Beethoven used to great effect in his Septet. One of Brawn’s strengths is to get inside each work and his treatment of these earlier works is exemplary. Sometimes it’s good to hear these less profound works and their placing on this disc is ideal. Faultless playing in my beloved Rondo, just a shame it’s not longer. The Waldstein brings this very generously filled and priced CD to a triumphant conclusion. The very positive comments above apply here to a genuinely exciting rendition of this great work. If it was in a public performance it would merit a standing ovation. As with the other sonatas James Brawn and Linda Marianiello have written excellent notes. This excellent disc of Beethoven sonatas is one I will return to regularly with great pleasure notwithstanding many other sets of these works. I greatly look forward to further volumes. I should add that in his survey of recent recordings of the piano sonatas my colleague Brian Reinhart has favourable comments on Brawn’s Beethoven.